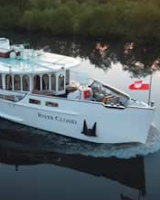 Sail away from the credit crunch aboard River Cloud (or River Cloud II). Enter the competition and you could win a luxury 7-day cruise worth £3,000. The luxury river yachts will take you along European rivers through Holland and Belgium. As any journey is an experience, this cruise will prove to offer you plenty of experiences. You will visit Amsterdam and its museums, art galleries, gardens and diamond workshops will keep you busy. Next point on your jouney will be Schiedam and then you can choose to visit Hague. The River Cloud will then take you to Antwerp where you can visit various art galleries and the house where Rubens lived. The organisers of this cruise will offe you an optional excursion in Bruge. The old part of the city is a UNESCO Heritage site and it is worth visiting. Your yacht will take you next day to Gouda which will impres your senses with its Gothic town hall, Renaissance buildings and of course, Gouda cheese which you can sample in the central market place. Being a roundtrip cruise, you will return to Amsterdam. Take your time to discover more of this city, stroll along its canals or rent some bicycles, enjoy you holiday and the fact that the best cruises in life are free.